Normally, 2 hours is outside the distance I would drive for a one day bridge game, but I really like Portland. I think it would be a fun place to live with its great restaurants and friendly people. 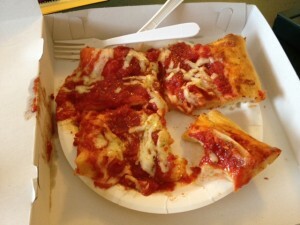 We grabbed a slice of Sicilian pizza at Micucci’s. Literally, a slice for the both of us, as the pizza is served in giant slabs. It’s served in the back of an Italian grocery store. There is a self serve metal rack with the different offerings but the line was 8 people deep, all waiting for pizza. When I saw the size of a slice ($4.75), I debated whether I should get two, or if one would be sufficient for the both of us. The guy behind me told I would regret getting only one as this pizza was “life changing,” I thought it was worth the risk, and bravely grabbed only one, when they came out piping hot from the oven. The piece was enormous enough that I had to cut it in quarters and I devoured one before I remember to take a picture. This was the best Sicilian pizza I’ve ever had (sorry, Umberto’s). The dough was amazingly tender, almost pillowy, but with a pleasant chew. I read that this is because they use more liquid in their recipe, resulting in 90% hydration as opposed to the standard 75%. The sauce had a perfect touch of sweetness and I inhaled my half in seconds. They were featured on Man Vs. Food for their Apocalypse Now Burger (topped with pork belly and foie gras! 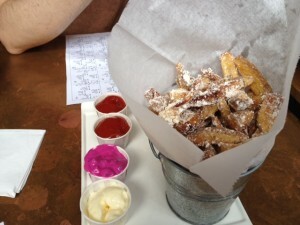 ), but it was the bacon dusted fries that caught my eye. Steve and I came here for a beer and a small bite in between the sessions, as we planned to have dinner after the game was over. The fries were excellent albeit salty, with real bacon flavor, but my favorite part was the beet tzatziki sauce that I chose for my dip (you get ketchup and your choice of one other sauce). The rest of the menu looks great and I would certainly come back again and again for the fries. It was easy to snag a table in the lounge area at 555, given the time (9pm). We shared a tomato and mozzarella salad which looked beautiful with the tri-color tomato slices, but they lacked the intense flavor I expect from an heirloom summer tomato. The mussels were steamed with cherry peppers, garlic and chives and it was unbelievably delicious. I was ready to drink the rest of the broth once I ran out of bread to sop it up. Our steak was advertised as “three-day marinated hanger steak,” and the flavor lived up to my expectations. The steak had an excellent char and was cooked to a perfect medium rare. It was served with a potato cake and grilled onions. We pre-ordered the coffee soufflé at the start of the meal. The soufflé was light and airy, but could have used more intense coffee flavor. I think a coffee sauce would have helped immensely. The bread basket was excellent; I loved the focaccia and the chive butter. Steve enjoyed a generous pour of wine and my cocktail was sweet and bubbly. 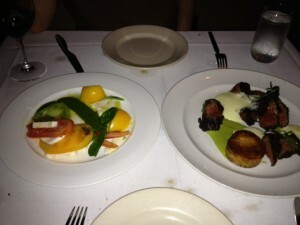 I really liked our server, as well.